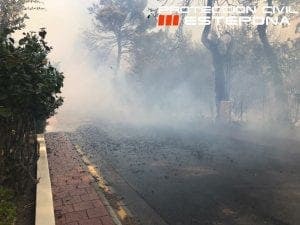 PHOTOS emerging from the fire blazing in Estepona show roads blacked out by smoke and bright orange flames. In one photo the fires can be seen tearing through an urbanisation, metres away from cars and houses. 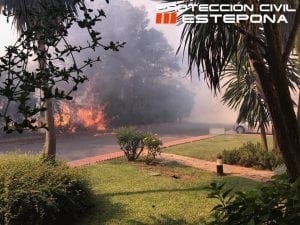 It comes as at least two helicopters and 16 firefighters are tackling flames in the El Velerin and Dominio Beach urbanisations. The cause of the fire is unknown but there are fears it could spread to nearby forest areas if it is not dealt with quickly. 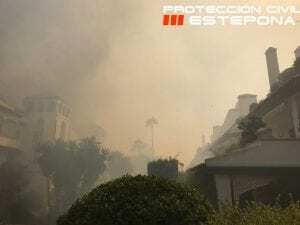 It comes after days of temperatures in the high 30s and 40s thanks to heatwave ‘lucifer’, which is being blamed for causing fires across Southern Europe this week.